Are the children in your school emotionally resilient? Can they persist when the going gets tough? Are they confident and self-motivated? Are they able to self-regulate and do they make friends easily? Research highlights the need for children to learn these fundamental life skills because those who do are better able to manage themselves and their emotions, thereby increasing their sense of fulfillment, belonging and achievement. 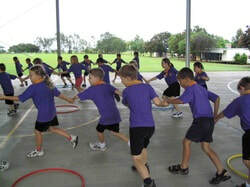 In this coming school year Play Is The Way® will offer schools the opportunity to see the significant social and emotional development that is possible when children participate in our unique physically interactive games sessions. Guided by Leroy Slanzi, students encounter individual and collective challenges that stimulate discussion, critical thinking, problem solving, collaboration, cooperation, empathy and very importantly self-control. Each 60 minute session involves the classroom teacher run a PITW game for 20 minutes, then Leroy runs a PITW game for 20 minutes, followed by a 20 minute observation conversation. Classroom teachers (and any other observers - the more the merrier) will see the issues that arise and how Leroy guides the class into harnessing and developing their personal and social capabilities to get the best out of themselves and others. It is invariably an enlightening experience. Play Is The Way® is a behaviour education program that uses physically interactive games, a set of guiding concepts that serve as a moral compass and a powerful self-reflective language that helps children to master their own behaviour. Children enjoy it because it is clear, logical and stimulating. Schools value it because it helps achieve independent, self-motivated, self-managing learners. This offering is the perfect way for schools already trained in PITW to further develop their confidence and understanding of the social and emotional development of their students. It is the perfect way to see how students respond to the process and to assess its long term value to their lives and learning. We recommend schools commit to having all of their trained teachers go through these sessions. If this opportunity interests you and you would like to talk further about the sessions and the Play Is The Way® methodology please email Leroy at playistheway@outlook.com. Duration: 60 minutes per session. Travel costs apply outside of the Nicola Similkameen Region. All PLAY IS THE WAY® supporting resources will be available to schools at a discount rate.